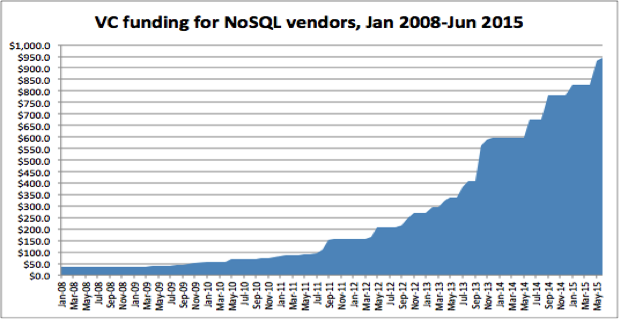 Since the third quarter of 2012, 451 Research has been tracking the mentions of NoSQL databases in LinkedIn profiles. It is a fairly crude but nonetheless interesting measure of the relative popularity of the various NoSQL databases. There has been a clear leader throughout this period, with MongoDB growing from 43% of all mentions of NoSQL technologies in LinkedIn profiles in Q3 2012 to more than 50% in Q2 2015. To be clear: MongoDB is mentioned in more LinkedIn profiles than all of the other NoSQL databases put together. If commercial success was purely a popularity contest, the rest of the NoSQL vendors could have packed up and gone home long ago, such has MongoDB’s dominance been in the past few years. However, there are plenty of other reasons to believe that the NoSQL market is still wide open, especially given the early stage of NoSQL adoption, and with the incumbent database providers also getting involved. As such, it’s likely that it will be the next few years, rather than the past few years, that will ultimately decide the winners and losers. Clearly, MongoDB is in an enviable position in the NoSQL space. It has the most paying customers – it claimed more than 2,500 in June, while MarkLogic cited about 500 in November 2014, DataStax reported more than 500 in May, Couchbase disclosed more than 450 in March, Basho counted more than 200 in June, and Neo Technology cited more than 150 in March. Given that all of these vendors are building businesses around open source projects, these numbers only tell part of the story. It’s impossible to know precisely how many MongoDB users there are, for example, although the fact that the company had more than 75,000 users of its MongoDB Management service (now renamed MongoDB Cloud Manager) in June perhaps provides a better indication of the amount of production deployments. MongoDB has also raised by far the largest amount of funding – approximately $312m compared with $190m for DataStax, $173m for MarkLogic, $115m for Couchbase and $53m for Basho. However, with great funding comes great expectations. Add to that the phenomenal popularity of MongoDB, and the pressure is certainly on the company to convert that popularity into dollars. Additionally, MongoDB may be ahead when it comes to customer count, but other vendors in this sector have arguably done a better job (so far) in terms of strategic deployments and accompanying deal sizes, and we believe the commercial market for NoSQL is much closer, in terms of revenue dollars, than download numbers and LinkedIn profile mentions suggest. According to the latest figures from 451 Research’s Total Data Market Monitor, NoSQL providers generated combined revenue of $514m in 2014. NoSQL revenue is expected to rise at a CAGR of 49% to reach $3.7bn in 2019. Revenue of $514m is just scratching the surface compared with the wider operational database market (of which NoSQL represents about 2% of total revenue), and it is also considerably less than the NoSQL vendors have raised in venture capital funding (approximately $945m). However, it has already been enough to make the established incumbents sit up and take notice. Oracle, Microsoft and IBM all now have NoSQL offerings of their own, while the NoSQL specialists also face competition from the likes of Amazon Web Services, Google and Rackspace. The NoSQL database market emerged in part due to the failure of incumbent relational database vendors to recognize the need for alternative approaches that valued flexibility over schema and availability over consistency. As such, it has risen largely as a complement to existing relational database deployments and, despite a lot of interest, is still in the very early stages of adoption. M&A activity has been limited – in part, we believe, because the incumbent database providers have yet to feel the competitive impact of NoSQL. While IBM nabbed Cloudant, Microsoft and Oracle have preferred to develop NoSQL technologies of their own. The NoSQL sector is on the brink of a wave of wider enterprise adoption and a new phase of competition. MongoDB may be the runaway leader based on developer adoption of NoSQL databases, but the race isn’t over yet. In fact, it has barely begun. This is an excerpt from a larger 451 Research report examining the potential for M&A activity in the NoSQL sector.